Martin Samuel of The Times was named the SJA’s Sports Writer of the Year for the second successive year in the British Sports Journalism Awards. 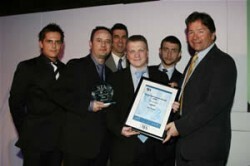 Samuel topped a poll of national newspaper sports editors to win the John Bromley Trophy for his writing during 2006. The annual awards, sponsored by UK Sport and organised by the Sports Journalists’ Association of Great Britain, were presented at a gala dinner in the City of London. The SJA Sports Photographer of the Year was Stu Forster of Getty Images, who impressed the judges to win the Sports Portfolio picture category, while Alex Livesey won Sports News Picture for capturing the moment that England effectively exited the World Cup. Sky television’s Jeff Stelling was acclaimed Broadcaster of the Year for the second time for his anchoring of the marathon Saturday afternoon show Soccer Saturday. Samuel is the first to retain Britain’s top sports journalism award since Patrick Collins (Mail on Sunday) in 1990 and, before that, Ian Wooldridge (Daily Mail) in 1987. Wooldridge, who died earlier this month, was represented at the event by his widow, Sarah, and was remembered by the 400 assembled journalists and photographers in the drinking of a toast. 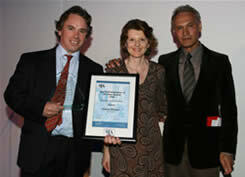 The SJA Awards also recognise the work of regional and specialist writers and photographers. There was a notable double by Doug Gillon of The Herald, Glasgow, who not only won the Regional Sports Writer title – which he had won previously in 2002 – but also took home the Specialist Correspondent prize. 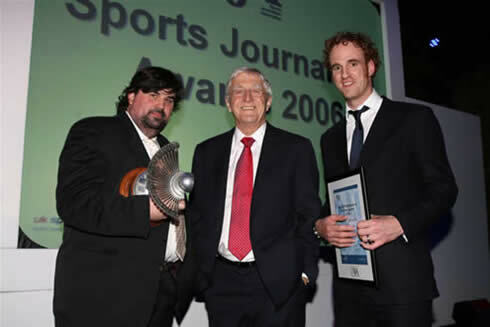 In addition to Samuel and Stelling, Paul Kimmage of the Sunday Times kept hold of the Sports Interviewer award, while James Lawton of The Independent was named Sports Feature Writer, having 12 months previously taken the Sports Columnist title. Alan Hubbard (Independent on Sunday) regained the Sports Diarist crown from Charles Sale (Daily Mail). In the four-year existence of this category, Hubbard and Sale are level 2-2. Getty Images snapped up three out of the four photographic prizes presented on the night, headed by Forster. It is the first time that Forster has won this cherished accolade, which was first presented 30 years ago. He received the Ed Lacey Trophy from Michael Parkinson, the SJA President. In the citation, read by Leo Mason, the chairman of the photography judges, Forster’s work, as illustrated here, was said to contain “the best action and news pictures, the greater variety of sports covered and general feature work”. It was a good night for the world’s biggest sports photo agency, and they showed that they are also nurturing new talent, with Julian Finney taking the Young Sports Photographer award for work that the judges called “outstanding” and which included an unusual angle on tennis player Andrew Murray. The Specialist Sports Photographer award went to the Racing Post’s staffer, Edward Whitaker. With 100 of the best pictures from this year’s entry, the SJA has organised a touring exhibition of the photographers’ work, to help to promote sports photography in Britain.